This book compiled by Sheri Perl Migdol and members of the Prayer Registry Team is an excellent little resource for grieving parents as well as those who seek to support them in their grief. Once you have gone to Sheri’s page click on the picture of the book to download a free copy of it. There are also more resources on Sheri’s page that may be helpful for you to consider. “Mindfulness is the ability to focus on the emotions, thoughts and sensations occurring in the present moment. It can ease a variety of mental conditions, including feeling bored, anxious or worried about a task. Mindfulness teaches us to make a conscious effort to stay in control and focus on the here and now. It teaches us to stop and concentrate on our breathing for a few minutes before continuing, paying close attention to the task at hand. It means our minds aren’t flitting from one subject to the next while we are doing one particular thing. From the Little Book of Spirituality by Gilly Pickup. Mindfulness for some is difficult and needs lots of practice. Our brains process and an extraordinary amount of information every minute. Most of which we are unaware of, but it goes on and on and on processing information. When in the grieving state mindfulness is often very elusive, however, it is just at that time where mindfulness comes into its own. Grieving takes a lot of energy and often our thoughts constantly wander into thoughts of what, why, what if, how can I go on and a million other repetitive thoughts. Some of these thought processes take over our lives and can create a world devoid of colour and energy. Anxiety looms large from these thoughts and feelings, and one soon begins to spiral or at least seem like being spun viciously out of control through a constant plethora of negative emotions, feeling helpless. Ultimately one begins to consider they are at the at the mercy of their misery. It is when thoughts run rampant where the getting into the practice of mindfulness can come into its own to help your mind and body take back some control. Mastering mindfulness will put you in charge of your grief and not render you a victim to its darkness. 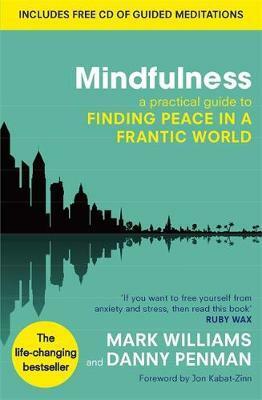 Another excellent resource that I have come across and personally used is “Mindfulness – a practical guide to Finding Peace in a Frantic World”, by Mark Williams and Danny Penman. It is a book that teaches you what is happening to you and how to go about finding that piece of peace. It also comes with a handy little CD. Check it out; it might just be one of the best investments you make in yourself on your journey through life. Communicating with a parent who has experienced a child/ren passing. Humans have been fascinated and yet fearful of the word death since time immemorial. It has been a fascinating area of research that I have been doing the past two years in my search for meaning to my daughter’s death. It was not until I buried the WHY word that I began to grieve progressively and dare I say in a more healthy way. Everyone grieves differently, but the loss of a child is by far the most devastating loss of all losses. Many people approach those whose child/ren have passed with a statement that damages further. Statements like “Oh I know how you feel, my mother/father/husband/wife died x days/months ago” – wrong: nothing, and I will repeat that for added emphasis, nothing compares to grieving a child. Every single parent who experiences this pain does so in a manner that is unique. No two people grieve in the same way or manner. It is a very odd thing indeed when we have a word for a woman who has had a partner die – widow when a man loses his partner he becomes a widower and when children are without their parents they are called orphans, but there is no word for the mother and father whose child dies. I wonder why. Emma’s death at times put me into surreal positions of wondering who was I now to be calling myself a mother. The implication of mother signifies that your offspring are accounted for somewhere among the living. It was certainly one of the oddest sensations that I endured, the complete loss of my role as a mother, a role that filled me with pleasure and pride. Equally hard are some of the inane statements made to us: statements like God needed another angel, she/he is at peace now, oh well at least you have x number of other children. So many foolish statements are made that often the person most in need of empathy ends up a mess. Another one is time heals, or you need to get on with life and stop dwelling on the past or your child would not want you to do, be like this. The same applies to be strong or turn to God he will help you. Not one of these is validating for the griever. Indeed they all hurt us more. Depending upon the circumstances individual statements about the environment are made. In my situation, I was told by a “healer” that if my daughter had thought positively, she would not have got cancer, and by the same person, she could have used her mind to get well. Really! Other similar statements were oh x, or y cures cancer did she do that. Now people get real, don’t you think that the oncologists and parents would have been all over it, about this so-called miracle and often expensive wonder drink/pill/thought. One thing that many people forget is that we have two ears and one mouth and ought to be used in that proportion. What a grieving person needs the most is to be listened to, to be valued, to be allowed to tell their stories over and over again. People often say I don’t know what to say, and that is okay because no words will be the right ones so it is better, to be honest, and say you do not know what it is like, I can only imagine, I cannot know. We who are grieving know that you do not know because unless you have been there, no-one can know the pain, the helplessness, the utter desolation that you feel especially in that first couple of years. My grief started with a state of catatonia, where one does not talk, is not aware of surroundings, etc. In other words a total break from reality. For the first two years, I lived in a fog-like atmosphere. This year has been the best and the worst regarding my grieving. It is still raw, but I am not so much at the mercy of my emotions as I was. Yes, time does soften the edges, but it will never heal my heart. A terrific little book that is worth downloading if you need to hear what works best for us is below.